The electrical conduction in synthetic, dry polycrystalline, iron-bearing olivine (Fo90) was investigated as a first-order approach to the electrical conductivity in the upper mantle. This fundamental study is of great importance to better understand the charge-transport mechanisms seen in olivine. Conduction processes in synthetic samples are not influenced by a complex geological history in contrast to conductivity in natural olivine. The experiments show that the apparent activation energy for conductivity for Fo90 is 230 kJ mol−1. In currently accepted defect modeling, natural and synthetic olivine requires a mechanism involving small polaron formation (Fe· Mg and magnesium vacancies (V Mg) as the dominant diffusing species to explain a fO 2 1/6 relation to electrical conduction. Here, Fo90 shows no contribution of small polarons to conductivity at temperatures between 1,000 and 1,200°C and almost no dependence on fO2. Instead, under reducing conditions magnesium vacancies (and electrons) appear to be the major charge carriers. The temperature distribution in the upper mantle, mainly composed of the mineral olivine, can be studied with magneto-telluric (MT) methods. The electrical resistivity in the lower crust and upper mantle can be inferred from modeling the response measured from the Earth’s surface to highlight anomalous regions such as the low velocity zone (LVZ). However, laboratory data of the electrical properties of olivine is needed to constrain the modeled inversion of MT data from the field. This study improves upon previous studies done on the electrical conductivity of natural olivine (Duba 1972; Roberts and Tyburczy 1993a; Constable and Duba 2002) by complementing other studies (Hirsch et al. 1993; Dai et al. 2008b) on electrical impedance experiments on iron-bearing, synthetic Fo90 under various temperature, grain size and oxygen fugacity conditions. Using synthetic sol–gel olivine, we attempt to avoid possible issues that can be encountered when measuring the electrical conductivity in the laboratory on natural material by acknowledging that synthetic olivine is free from impurity atoms, is fully buffered by enstatite and has a very low water concentration. The data give new critical insights on the conduction process in olivine by identifying the charge carriers and their associated apparent activation energy and the role of conduction in the bulk material and grain boundaries. The theoretic fO2 dependence on the conduction process in natural olivine has an exponent of 1/5.5 or 1/6. This is close to what some experimental work is showing but often those results tend toward lower values (Constable and Duba 2002; Roberts and Tyburczy 1993a, b). An empirical Arrhenius relation is obtained within the stability field of olivine at moderate to high temperatures (1,000–1,400°C). Electrical conduction in minerals depends on various factors, including temperature, composition, defect concentrations and the frequency of the passing electrical current. The latter two are of specific interest in this study. The conductivity–oxygen fugacity relationship allows for the determination of the possible conducting defect species. Using an alternating current, the frequency dependence of conductivity allows one to identify different conduction mechanisms in series. If the conducting species are ionic, such as magnesium ions and oxygen vacancies or interstitials, and transported by solid-state diffusion, then following the Nernst–Einstein relation, both electrical conductivity and diffusion mechanisms should share similar activation energies. For example, a comparison can be made with the activation energy and microstructural evolution of synthetic forsterite aggregates deformed to high strain (Kellermann Slotemaker 2006). Unlike experiments on synthetic forsterite (Fo100), (Hinze et al. 1981; ten Grotenhuis et al. 2004), such experiments must be carried out in a reducing environment to keep Fo90 within its stability field. However, they may be carried out under atmospheric pressure because the electrical conductivity in olivine is not significantly affected by pressure (Xu et al. 2000) and only up to 0.6 log units of conductivity from 1 to 4 GPa for a lherzolite (Dai et al. 2008a). The conductivity experiments reported here were carried out using such controlled atmosphere conditions. The Fo90 samples were prepared via a sol–gel synthesis method similar to the one used by McDonnell et al. (2002), but modified to include FeO in a diphasic gel with MgO in tetraethyl orthosilicate (TEOS). The dried gel is sintered at 950°C for 2 h in a controlled atmosphere furnace (fO2 = 10−11 Pa). The 70% reacted product is cold isostatically pressed with 2.5 wt% glycol binder at 100 MPa. The cold-pressed billets then reaction sintered at 1,250°C and fO2 = 10−5 Pa to complete a densified material with a porosity between 10 and 12%. 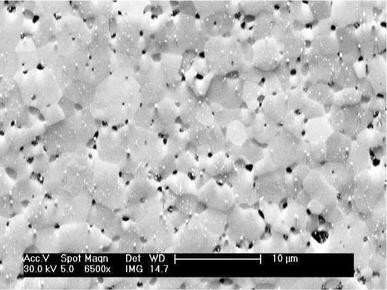 The result yields an initial grain size of 0.3μm with 5% enstatite (Mg0.9Fe0.1SiO3) revealed by X-ray diffraction. The total impurity content of all cations other than Mg and Fe is 0.02 wt% (Kellermann Slotemaker 2006). The instruments that were used to measure these concentrations are the electron probe microanalysis (EPMA) and the inductively coupled plasma atomic emission spectroscopy (ICP-AES). The results are shown in Table 1. Each sample was re-sintered for a different duration at 1,300°C to obtain different grain sizes. The grain size is determined from orientation contrast scanning electron microscopy (SEM) micrographs using the method described by Jackson et al. (2002) to account for sectioning bias. Table 2 shows the samples used in the electrical conductivity experiments. The samples are about 12 mm in diameter and 1–1.5-mm thick. The enstatite phase, as a silica buffer, is not expected to affect the conductivity measurements significantly (Hirsch et al. 1993) even though the defect population is affected (Wanamaker and Duba 1993). After sintering and oven drying the samples, the water concentration most likely tallies with previously measurements on similar material using elastic recoil detection and is probably in the order of 0.05 ± 0.02 wt % (McDonnell et al. 2002). Electrical impedance measurements were taken with a Solartron 1260A Frequency Response Analyser and its range extended from 106 to 1014 Ω by the use of a Solartron 1296A dielectric interface. Two 0.5-mm thick platinum electrodes above and below the sample form the cell with shielded platinum wires. A grounded platinum guard ring surrounds the top electrode to ensure that flux is restricted to between the electrode plates (see Fig. 1). The open cell capacitance of the system is 2 pF. Two linearized type-S Pt/Pt-10%Rh thermocouples are used to measure the temperature above and below the sample to ±0.2 K. A zirconia-based oxygen sensor with its own thermocouple allows direct measurement of oxygen fugacity. We used a CO2/CO gas mix to obtain each oxygen fugacity condition, and the flow was regulated by four Bronkhorst precision mass flow controllers (two for CO2 at 50 and 100 ml/s and likewise two for CO). The data are represented in Nyquist plots of (Z″) versus (Z′). This usually results in a number of complex impedance arcs that represent the resistive and capacitive elements of the sample plus cell. The system was first checked for reproducibility against previously measured pure forsterite material (Appendix, Table 4) to verify the insensitivity of Fo100 to heating/cooling and reducing/oxidizing cycles. For these experiments, measurements were taken in a temperature decreasing manner starting at the highest temperature at every fO2. Once a temperature setpoint was reached at a rate of 10°C per minute, the sample was left to equilibrate for up to a couple of hours before measurements were accepted. At a set temperature, the oxygen fugacity was varied by changing the CO2/CO gas mix ratios from reducing toward oxidizing conditions and back again to check reproducibility. At every fO2 the system was left to equilibrate for 15 min. Time constraints, however, prevented longer equilibration periods at every fO2. For the Fo90 runs, the temperature range was 1,000–1,200°C and the frequency range from 10−3 to 106 Hz, with eight steps per decade. The oxygen fugacity range was nominally taken to span the stability field of olivine (∼5.3 × 10−10 Pa to ∼4.1 × 100 Pa at 1,200°C; Nitsan 1974). The points on the impedance arcs where they approach the real (horizontal) axis provides the resistance, which by sample geometry gives the conductivity associated with each conduction process (see Table 2). The logarithm of these data can be plotted against reciprocal absolute temperature to obtain an Arrhenius relation and the apparent activation energy for the conduction process. The data can further be plotted in a logarithm of conductivity versus logarithm of oxygen fugacity plot which is then modeled in this study using a pre-existing model developed by Constable and Roberts (1997). where × denotes a neutral state and · an oxidized state (loss of one electron). The subscript denotes the site where the atom/ion is located. The conductivity model equations are as follows. where μMg, μFe and [V Mg ″ ],[Fe· Mg] are the mobility and concentration of the species. A x and E x are in J/mol and X denotes either Mg or Fe (see Table 3). c e is the concentration of semi-conducting electrons (calculated from the temperature and bandgap of olivine). Figure 2 is an SEM orientation contrast (OC) image highlighting the representative microstructure of the various samples. The microstructure is a typical foam texture achieved once equilibrium is reached between grain growth and sub-grain formation. The solid black features are visible as the pores in the sample. The calculated porosity values of each sample, after sintering, for areas between 2,000 (Fo90a) and 11,000 μm2 (Fo90b, c) are shown in Table 2. The electrical impedance of the synthetic iron-bearing olivine samples is characterized by often two and sometimes three arcs in the impedance plane with the imaginary (−90°C out of phase) impedance against the real impedance (or resistance). Multiple arcs imply that there are additional, time delayed, responses from the material to the electrical conduction, out of phase to the applied voltage. Factors that can cause additional effects like these are grain interiors, grain boundaries and porosity (Calame et al. 1996). Figure 3 shows the electrical impedance data at 1,100°C and at fO2 = 5.5 × 10−5 Pa. ZView model parameters for arc fitting are shown in the Appendix (Table 5). The three arcs become progressively and strongly depressed (away from simple semicircles below the real axis) toward lower frequencies. This is due to low frequency dispersion (LFD) and is the consequence of a frequency-dependent increase in cell capacitance toward lower frequencies. A plot of the real and imaginary components of the relative permittivities for this experiment illustrates this well (Fig. 3). Both components increase rapidly toward lower frequencies implying that the permittivity magnitude (cell capacitance) also rises by six orders of magnitude from 100 kHz down to 1 mHz (from a few picofarads to microfarad levels). LFD is associated with charging of interfaces, including the attached electrodes, and/or the AC response of distributed components related to grain and grain boundary size distributions etc. (Jonscher 1991, 1989). These may include distributed equivalent circuits like transmission delay lines with diffusional properties [e.g. fractal distributions of RC component values as studied by Le Mehaute and Crepy (1983)]. A solution to the problem is to use a constant phase element to fit the data rather than a simple parallel RC model (which would imply a frequency independent capacitance in parallel with a constant resistance representative of the conduction process). The applicability of such approaches are discussed in Bisquert et al. (1999). The three component circuit model, applied to this experimental dataset, consists of three constant phase elements (CPE), which are modified capacitors that allow for the correction of a depressed semi-circle, each in parallel to a resistor. Extrapolating each arc to the X-axis gives the resistances which are roughly 438 kΩ (R1), 625 kΩ (R1 + R2) and 813 kΩ (R1 + R2 + R3) respectively. Table 2 lists all the activation energies in kJ mol−1 and note that the activation energy for grain boundaries (second arc) is notably larger. These data were obtained from conductivity experiments on Fo90 under a constant oxygen fugacity of ∼1 × 10−5 Pa for a temperature range of 1,000–1,200°C and different grain sizes. Table 4 in the Appendix shows the original resistance data. Figure 4a shows a compilation of some of the conductivity data on olivine, synthetic and natural, up to date as well as data from the current study where the activation energies are obtained from the slopes. The black circles represent Fo90a with a grain size of 1.8 ± 0.1 μm, the dark grey diamonds, Fo90b with a grain size of 3.5 ± 0.2 μm, and the light grey triangles or Fo90c has a grain size of 4.2 ± 0.3 μm. Interestingly, Fo90b shows the highest electrical conductivity of the three. Presumably this is a function of grain size, porosity and electrode–sample contact. However, the relationship is not coherent. Bulk activation energies for the diffusion of ions, vacancies and/or electrons for all Fo90 samples of this study are close to 230 kJ mol−1 despite of the limited range in grain sizes. The scatter of all data is most likely due to the use of different olivine specimens. There does not seem to be a coherent differentiation between the electrical conductivity of Fo100 and Fo90 (this study) for high temperatures. That is, Fo90a with the same grain size as 1a (ten Grotenhuis et al. 2004) almost overlap. At lower temperatures, Fo100 shows 1–3 orders of magnitude lower conductivity than Fo90. Additional electrical conductivity experiments were carried out for each sample under a constant temperature of 1,100°C and varying oxygen fugacity within the olivine stability field at that temperature. Unlike natural olivine, Fo90 behaves very differently under the same reducing conditions (Fig. 4a, b). Although the absolute conductivity is less at higher fO2, there is no fO 2 1/6 relation for bulk conductivity. Figure 4c shows the final data for Fo90c at different temperatures and with electrical conduction a function of the oxygen fugacity. Fo90a and b showed similar trends, only with different magnitudes of conductivity and are therefore not shown. The data have been modeled according the model parameters shown in Table 3. Despite of some scatter in the data, especially at lower temperatures, the fits are generally well constrained. All the data in Fig. 4 are based on the first arc where it intersects the X-axis in the Nyquist plot of the imaginary versus the real impedance. However as Fig. 3 shows, there is a second arc as well that relates to another conduction mechanism in series with the aforementioned. The conductivity data from the second arc are shown in Fig. 5 for various temperatures. Current data for synthetic olivine are shown in comparison with data on different natural olivine specimens from a previous study by Roberts and Tyburczy (1993b). Main differences are that the conductivity for this conduction mechanism in Fo90 is much lower with a higher activation energy at comparable temperatures (see Table 2). In addition, the slopes of the plotted data show a much stronger negative trend with oxygen fugacity. This can shed some light on the possible conducting species, which is further explained in the “Discussion”. Fo90 results are very similar compared to natural olivine in terms of absolute electrical conductivity, despite the scatter of data for different natural olivines. However conductivity shows a different relation to the oxygen fugacity, implying a strikingly different diffusion mechanism of interstitials and vacancies in Fo90. Natural olivine has potentially been through a complex geological history to arrive at the Earth’s surface. Fluids could have altered the samples, and there would be a minor presence of different phases such as magnesium wustite (MgO) and spinel. Olivine may not be in equilibrium with a stable silica activity. There are other elements and metals such as nickel (Boland and Duba 1986), carbon and calcium present that can act as contributing charge carriers or inhibit conduction as interstitial ions (Drury and Fitz Gerald 1996). Iron is likely not to be in its fully reduced state in the olivine crystal structure, and the original grain boundaries in natural olivine aggregates are often destroyed during sample preparation and may even contain natural melt films (Hirth and Kohlstedt 1995; de Kloe et al. 2000). For samples synthesized using sol–gel techniques, grain boundaries are formed with a clean foam texture, providing the same material for each experimental run and excluding many other contributing conducting species. While natural olivine probably contains more representative concentrations of transition metals, rare earth elements and so forth, it is important to isolate each contributing factor to better understand the electrical conductivity processes. This, in turn, will be beneficial for accurate magneto-telluric modeling of the temperature gradient in the Earth. Controlled experiments with added impurities in the sol–gel such as Ti and Ca may be an interesting approach for further experimentation. Finally, it is well known that Fe loss from olivine to the Pt electrodes occurs under experimental conditions. Surface destabilization experiments were carried out on San Carlos olivine by Jaoul et al. (1987). At 1,400°C for 20 h, ∼100 μm of the sample surface has become depleted in iron. In addition, at 1,300°C and at fO2 = 10−4.5 Pa it takes >120 h to convert Fo90 to Fo100 for a sample of 1–2-mm thickness. Since experiments in this study were not carried out above 1,200°C and no longer than 16 h, the Fe loss to Pt electrodes is minimal and unlikely to affect the electrical conductivity of Fo90. In any case, the full reversibility with temperature cycling gives no reason to suspect significant loss of iron to the electrodes. The results in Fig. 3 show that up to three impedance arcs are generated in an impedance plot going down to frequencies as low as 10−3Hz. These three relaxation times are associated with different conduction pathways or mechanisms. The depression of the arcs is related to electrode interface charging effects and possibly due to distributed conductive/capacitive grain-scale effects, such as the grain and grain-boundary size distributions. The magnitude of the effect (six-order increase in cell capacitance) and the depression of all arcs together suggest that the effect does not lie in the sample itself but at the sample/electrode interface. It was previously confirmed that the porosity does not appear to influence the impedance arcs (ten Grotenhuis et al. 2004). Although minor porosity (as shown in Fig. 2) may influence existing arc shapes or conductivity (Calame et al. 1996), the likelihood that porosity can induce an additional impedance arc is debatable (Barsoukov and Macdonald 2005, p. 218). While pore surfaces may offer additional surface conduction pathways, these will be in parallel with grain boundary conductivity. The result is that in a likely scenario both pathways reduce to a single RC equivalent component represented by a single arc. In contrast, serially connected elements of the material (i.e. grain-grain boundary and electrode-grain interfaces), are likely to produce distinct arc signatures as long as their RC values are substantially different. Figure 4b shows that conductivity in a single crystal along a particular crystallographic axis is higher than for aggregates (Constable and Duba 1990; Roberts and Tyburczy 1993a), illustrating the blocking nature of the grain boundaries present in the aggregate at lower fO2. Also it appears that the difference between the Red Sea olivine (single crystal) (Schock et al. 1989) and San Carlos olivine (single crystal) (Du Frane et al. 2005) is almost one order of magnitude, thus highlighting the natural compositional variation and possibly more oxidized state of San Carlos material. The data from ten Grotenhuis et al. (2004) show, in Fig. 4a, a decreasing conductivity with increasing grain size. This result is puzzling if the impedance spectrum is interpreted properly for dominant grain interior bulk conduction, but not if grain boundary conduction is dominant, i.e. not blocking the serial grain to grain connections but working in parallel with the grain interiors. The conduction pathway for parallel conducting boundaries will result in a single arc representing both interior and grain boundary conduction. Finer material has a higher ratio of grain boundary surface area versus grain interior volume, therefore showing a higher conductivity. The important difference between the study of ten Grotenhuis et al. (2004) and this study is the presence of a second arc in Fo90, which appears to be absent in Fo100. This suggests a grain boundary conduction blocking role for the additional iron, although the magnitude for grain interior conduction is similar to Fo100. Thus seeing as the Fo90 data has separable bulk grain-interior and grain boundary values and only the bulk values are plotted in Fig. 4a then no grain size dependence is expected or seen. Other studies suggest that the grain size effect is at best small (Xu et al. 2000; Wang et al. 2006). This apparent consistent relationship may be an artefact of fO2 and temperature conditions not being in equilibrium for the olivine specimens. Nonetheless, more data for a greater range in grain size is needed to confirm this kind of relation as function of conductivity. Three similar impedance arcs were observed at low temperature (∼300°C) in an electrical impedance study on γ′-Bi2MoO6 concerning electrolytes (Vera and Aragon 2005). With increasing temperature, the second arc is seen shifting to a higher frequency which is interpreted by the authors to be consistent with higher electrical resistance in the grain boundaries than in the bulk. Similarly, there is a higher apparent activation energy associated with the second arc from current data (Table 2). However, the authors noted that at above 500°C the second arc is no longer evident because it appeared that grain boundary conduction has exceeded grain interior conduction. In natural dry melt-free olivine a physical reason for a higher resistance in the grain boundaries is that the grain boundaries may be impeding the current because of defect aggregation (Roberts and Tyburczy 1991, 1993b) and that the grain boundaries are more resistive to ionic conduction at relative low temperature. This study concurs with previous studies that the first arc represents bulk conduction but more data on larger grain size variations is needed. The third arc is often associated with the electrode-sample interface (Roberts and Tyburczy 1991; Vera and Aragon 2005). The LFD seen in our experiments would also support strong electrode/sample interface effects, as the very large (6 order) increase in cell capacitance toward low frequencies is typical of double layer charge build up on metal electrodes. Ions transported in the sample will, on reaching the electrodes, be required to transfer electrons via redox reactions to allow uninterrupted conductive flow of charge in and out of the metal connections. If these redox reactions are inhibited then charged ions will accumulate at the electrode interface, and the charge accumulation will be seen as an increased cell capacitance. At high frequencies very few ions will migrate far enough to reach the electrodes and so charging will be minimal. The LFD due to electrode interface will affect all the conduction mechanisms occurring between the electrodes and all arcs will be depressed increasingly as a function of fall in frequency, as they appear to be. Figure 5 shows conductivity data obtained from the X-intercept of the second impedance arc. The slopes lie at least up to an order of magnitude lower and are significantly steeper than the slopes of the fitted data by Roberts and Tyburczy (1993b) show. The data cannot be explained by conduction processes described by the defect model of Hirsch and Shankland (1993). A quantitative model for grain boundary conduction has never been attempted. One could only speculate that these conduction processes may likewise be assisted by ionic conduction. Mg and Fe interstitials do contribute such a negative dependence of the conductivity on oxygen fugacity. The second impedance arc is related to grain boundary conduction assuming that the diffusing ionic species are hindered by defect/dislocation aggregations in the grain boundaries yielding a lower relaxation time. Oxygen vacancies might play a diffusive role as well since the concentration of this type of vacancies in the grain boundaries in synthetic olivine is equally speculative. However, the oxygen vacancy concentration would have to fall with increasing fO2 to give a negative exponent fO2 dependence of 1/6 on conductivity. Nonetheless, the unknown dimensions of the grain boundaries makes it difficult to model grain boundary conductivity data. Additionally, the defect models take into account full stoichiometry of olivine which most likely does not apply to grain boundaries. The fact that there does not seem to be a coherent change between the electrical conductivity of Fo100 and Fo90 is puzzling. This is at odds with previous experimentation on olivine crystals with varying iron concentrations in the range of 8–34% Fa demonstrating over an order of magnitude increase in conductivity with increasing Fa content (Hirsch et al. 1993). One could argue that the increase in conductivity from Fo100 to Fo90 is overshadowed by the uncertainly and scatter between current experiments at different grain sizes. On the other hand, the Fo100 experiments were carried out in air rather than in a controlled atmosphere. Quantitative models show that even minute amounts of Fe in olivine cause an increase in the electrical conductivity through small polaron hopping on Fe on Mg sites (Hirsch and Shankland 1993). Generally, an increase in heterogeneity also increases the overall bulk conductivity. Bulk conductivity data from this study in Fig. 4a plots with a similar slope to the data from (ten Grotenhuis et al. 2004) indicating that electrical conduction in Fo100 and Fo90 occurs via a similar diffusion process with similar activation energies. Fe–Mg diffusion in olivine has yielded a similar activation energy of ∼200 kJ mol−1 (Dohmen et al. 2007). For synthetic single crystal iron-bearing olivine, a lower activation energy was obtained of only about 130 kJ mol−1 as a function of iron content for a constant CO2/CO gas mix of 5:1 (Hirsch et al. 1993). This indicates that grain boundaries can raise the activation energy for electrical conductivity in fO2. It can generally be seen that at higher temperatures above 1,200°C there is an abrupt change in the slope of the data. This generally indicates a change in diffusional species from ones with a lower apparent activation energy to ones with a higher activation energy such as mixed electronic/ionic diffusion to pure ionic diffusion. Finally, but importantly, Wanamaker and Duba (1993) show that at 1,200°C at least 5 h is required to reach full equilibrium. That would mean that for these experiments the samples were not yet fully equilibrated to the surrounding oxygen fugacity and temperature and this probably has affected the activation energies, obtained here, somewhat. Up to date, experiments demonstrated that for San Carlos single crystal olivine, diffusion coefficients as a function of fO2 have positive slopes with an fO2 exponent of +1/4 to +1/7 (Du Frane et al. 2005; Dohmen et al. 2007). This is mostly consistent with various attempts made to quantify the defect population and charge carriers in olivine (Stocker 1978a, b; Hirsch and Shankland 1993). Figure 4b, c clearly demonstrates that bulk conductivity data of Fo90 for different grain sizes under a range of reducing conditions does not show a significant exponential dependence on fO2 predicted by the models. The model fit used here is modified from Constable and Roberts (1997). The data from this study show an overall conductivity contribution from magnesium vacancies and electrons whereas the contribution from Fe· Mg (small polarons) is negligible such that the concentration of Fe· Mg does not provide an exponential slope as a function of the conductivity on fO2. All the model parameters are shown in Table 3. Modeling the electrical conductivity data of Fo90 against the oxygen fugacity at different temperatures supports the assumption that ferric iron as a small polaron cannot be a major charge carrier for this material as long as olivine remains under reducing conditions within its stability field. It is important to note that forsteritic olivine will have a higher concentration of electrons (n-type conductivity) rather than electron holes/small polarons (p-type conductivity) (Boland and Duba 1986). One could imagine n-type conduction dominating across the whole range of olivine with a falloff in importance toward oxidizing conditions for iron bearing olivine rather than for forsterite (Boland and Duba 1986, Fig. 7b). It is possible that e′ is the dominating charge carrier in these experiments as well as for Fo100 and that small polaron conduction plays a lesser role even toward more oxidizing conditions. That is, either there are not enough small polarons around to influence conductivity at different fO2 or small polaron conductivity is countered by magnesium vacancy or oxygen interstitial charge carriers to sum to a near-zero fO2 dependence. In addition Hirsch et al. (1993) suggest that the constant-fO2 activation energies obtained, like the ones in this study, are expected to include a significant contribution from electrons that have relativity large formation energies. An excursion outside the stability field of olivine clearly caused substantial oxidation and recoloring of the specimen and enhancement of the electrical conductivity presumably due to a significant increase in small polaron concentrations. Since we are observing the same fO2 range for natural olivine with roughly the same fayalite content, it is suggested that natural olivine must have a higher concentration of small polarons that contribute sooner to an increase in conductivity toward more oxidizing conditions. Similarly, experiments on iron-bearing olivine have demonstrated an electrical conductivity proportional to X Fe 1.8 (Parkin 1972; Hirsch et al. 1993), which agrees well with a model based on conduction controlled by small polaron hopping. However, inferior single crystal quality and a decrease in homogeneity appears to raise the exponential dependence to X Fe 0.73. Other candidates that could act as charge carriers such as oxygen interstitials and vacancies and silicon interstitials are not likely to play a large role as their mobile concentrations are too low and/or have a high apparent activation energy for conduction. Additionally, each species demonstrates a particular dependence on the oxygen fugacity (Hirsch and Shankland 1993). That rules out oxygen vacancies, for instance, as it will always display a negative relation between conductivity and oxygen fugacity. 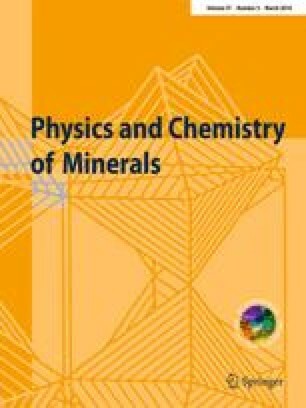 Conductivity data obtained in this study can be used for geophysical applications such as magnetotelluric methods (MT) of the upper mantle. Laboratory data can aid in accessing whether the region measured in the mantle is predominantly olivine. In addition, a geotherm can be constructed based on these laboratory results which demonstrate a conductivity dependence on temperature and whether the mantle may be layered (Xu et al. 1998). These data provide a background level from which additional parameters can be investigated such as the effect of partial melts on the conductivity in olivine (for melts from 0.01 to 0.1% there is an increase in conductivity by at least two orders of magnitude; ten Grotenhuis et al. 2005). In addition, the effect of water on the electrical conductivity in olivine is also very significant. The electrical conductivity of the oceanic asthenosphere is typically ∼10−1 Sm−1, e.g. Lizarrale et al. (1995), and that of the continental upper mantle of the same depth range is ∼10−2 Sm−1, e.g. Tarits et al. (2004). In experimental laboratory research it has been shown that increasing the water content of olivine to 0.1 wt% causes an increase in the electrical conductivity to ∼10−1 Sm−1, comparable to that of the oceanic asthenosphere (Wang et al. 2006). Because the synthetic samples used in this study are entirely dry, the absolute conductivity values are much lower at ∼10−3.5 Sm−1. In comparison, it would therefore seem that the effect of the presence of water is many orders of magnitude higher than the effect of grain size and oxygen fugacity on the electrical conductivity in olivine. Furthermore, via the Nernst–Einstein relation, the conduction of ions can be linked to the diffusion of bulk material that occurs during deformation processes, e.g. creep. The activation energies obtained in this study at different grain sizes are, however, lower than what normally would be obtained in creep experiments due to mixed conduction of magnesium vacancies and electrons (e.g. ∼315 kJ mol−1; Hirth and Kohlstedt 1995). Experiments on Mg and Fe diffusion, on the other hand, have given activation energies of e.g. ∼200 kJ mol−1 (Dohmen et al. 2007) which compare very well with the current results for electrical conduction in olivine. Using data from experiments on synthetic iron-bearing olivine is a first order approach where one has better control over the chemical, electrical and physical composition of the material representative of the upper mantle. This eliminates any uncertainty over additional undesired variables for MT modeling. The electrical conductivity data of dry synthetic Fo90 from defect modeling show no significant (fO 2 1/6 ) dependence on oxygen fugacity, and magnesium vacancies (and electrons) appear to be the major charge carriers in the bulk material within the olivine stability field. An apparent activation energy of ∼230 kJ mol−1 is obtained in the temperature range of 1,000–1,300°C for bulk conduction. There was no apparent dependence of grain size on the electrical conductivity for the small range of grain size studied. The use of “natural” olivine obtained from surface sources is likely to give misleading values of conductivity and oxygen fugacity dependencies due to natural alterations, impurity contributions and possibly a larger contribution of small polarons (Fe· Mg). Synthetic olivine material provides a reliable baseline for conductivity data that can be further expanded upon by introducing water and/or realistic small impurity concentrations such as Ti and Ca. P. van Krieken, G. Kastelein and E. de Graaff are greatly thanked for technical support and preparation of the Fo90 samples. Many thanks to I. Jackson for helpful comments. The manuscript was substantially improved with corrections and suggestions by J. Roberts and an anonymous reviewer. The Netherlands Research Center for Integrated Solid Earth Science (ISES) financially supported this work.